The basis and evolution of neuroscience is attributed to a great extent to greek physicians. Greek physicians were these people who laid the foundation of medicine and neuroanatomy. 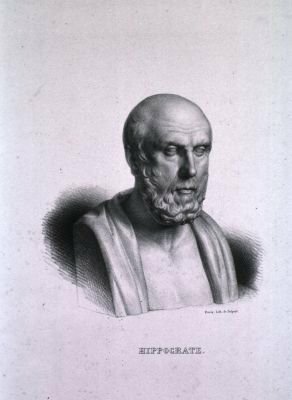 Hippocrates ( 460- 377 B.C.E.) is considered to be the father of medicine. He remained powerful in medical circles throughout antiquity and beyond. He was the first who observed the lateralization of brain function just in 4th century BCE. 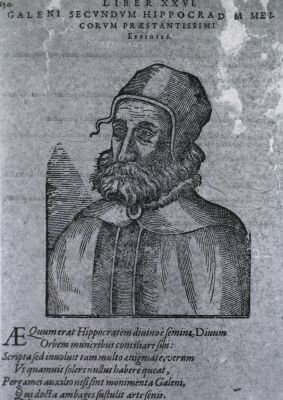 The impact of Hippocrates on the neurological thought was enormous. According to his study of anatomy, the human brain has two halves divided by a membrane. He made a distinction between the meninges- dura and pia.Then, he labelled the brain as a phlegmatic organ and identified it as the origin of certain diseases. After careful observations of his patients, he realized that an injury to the right side of the head causes palsy or spasms to the left side of the body. He stated that the principle to rule over the rest of the soul resided in the left ventricle. It contains outstanding concepts about the brain as the seat of human intellect as well as passages dealing with the effects of brain injury. In one of his books , ''De morbo sacro'' he points out that the brain was regarded as the seat of judgement, emotions and aesthetic activity. Specifically, he states that : ''our pleasures, joys , laughter and jests arise from no other source than the brain; and so do our pains , grief, anxiety and tears. Through it...we also discern ugly and beautiful , bad and good, pleasant and unpleasant''. Generally, thinking activity , moral consciousness, perceptive elaboration and control of body's movement were functions all localized in the brain. Very significant was his contribution to the study of epilepsy>επιλαμβάνειν on his book ''On the sacred disease''. He concluded that sacred disease, which is epilepsy was neither sacred nor divine. It was most likely inherited and it caused by brain malfunction. Hippocrates claimed it has a natural cause. Its cause found on the brain.As he wrote: '' the eyes and ears and tongue and hands and feet do whatsoever the brain determines; there is an element of intelligence in the whole body...but it is the brain thst is the messenger to the understanding''. He strongly believed that the brain was liquefied due to epileptic seizures.He also noted that epilepsy can occur at any age. Furthermore, he gave an explanation for other diseases related to the malfunction of the brain , such as mental insanity. He perceived it as a process of brain corruption induced by bile , one of the four humors ( blood, yellow bile , black bile and phlegm) which was responsible for the state of health. One of the most famous Hippocratic neurological diagnoses was epidemic paralysis of legs , which is today called as poliomyelitis. He spoke of hydrocephalus with the meaning of fluid collection under the bones and around the brain. In general, he believed that the appearance of diseases is connected with the deregulation of equilibrium of humora in human body. According to his studies, the correlation between these four humors has major impact on brain function.. The Alexandrian physicians were the first in medical tradition to perform systematic dissections of human cadavers. Among the main contributions in the field of human anatomical dissections, those made by Herophilus of Chalcedon( 335- 280 B.C.E. ) stand out. Herophilus&apos; contribution to brain anatomy was priceless. He was proclaimed as &apos;&apos; father of anatomy&apos;&apos;. He was the first to appreciate the true nature of the nerves as the communications network of the body. Firstly, he regarded the brain as encephalon and also the suggested the cerebellum as parencephalon. Secondly, he made significant discoveries of the nervous system. One of them was the distinction between the cerebrum and the cerebellum and their different functions. Moreover, he found the difference between nerves and arteries.In addition, he regarded the brain as the seat of intellect as well as the centre of nerves. Not only he studied the internal surface of the skull, but also he found and described cranial nerves, such as optic, oculomotor, trigeminal, facial, auditory and hypoglossal.He also described the main ventricles of the brain ,making the fourth ventricle the seat of intellect. He described the floor of the fourth ventricle , comparing the indentation in the brainstem to the cavity in the ink pen used by the scholars in Alexandria, so we still have the term &apos;&apos; calamus scriptorius&apos;&apos; ( calamus> κάλαμος - the object made by pen) . We also have the term &apos;&apos; torcular herophili&apos;&apos; , which he identified as the confluence of the cerebral veins. Herophilus called the three membranes of the brain &apos;&apos; chorioid&apos;&apos; , because they resembled the chorionic envelope surrounding the fetus. Specifically, the lateral ventricle was responsible for judgement and was located in the anterior part of the brain, Third ventricle was found in the middle part and regulated cognition. However, the fourth ventricle, which was in the posterior part was regarded as the most important. Herophilus placed the central control in the fourth ventricle of the brain. For him this ventricle was the seat of hegemonikon. As Galen reported : &apos;&apos; Herophilus placed the controller, hegemonikon, in the hollow of the brain which is also the base. In general, Herophilus recognized that ventricles allow passage of the psychic pneuma, because they are in reciprocal communication. Therefore, there is an obligatory passage from the front ventricle of the cerebellum. His most impressive achievement in neuroanatomy was the identification of the peripheral and cranial nerves that connect to the brain so a to allow motion and sensation. He was the first who observed the difference between motor and sensory nerves. His realization was that motor nerves (= kinetika) joined to muscle and sensory nerves (= aisthetika) to organs of sensation. Finally , he described lower brainstem and spinal cord as one structure called as &apos;&apos; spinal marrow&apos;&apos;. Herophilus found that all the nerves of the body below the head grow either from cerebellum or from the spinal marrow. 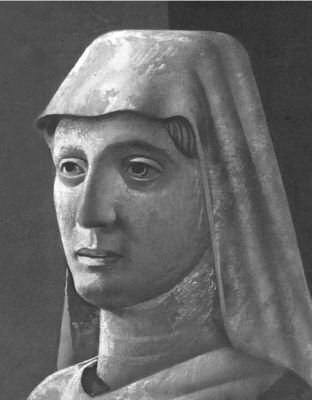 Galen of Pergamon ( 129 AD - 210 AD) was one of the most important figures in classical medical science. Galen's achievements in neuroscience were great and long lasting. For Galen , the main point of brain anatomy was the ventricles. He stated that the central function of them was to produce and distribute psychic pneuma , the vital force throughout the nervous system. Except for that , he also gave an explanation for all the functions of the nervous system ( both intellectual, motor and sensory) . Hence, he emphasized that all these functions were due to psychic pneuma, which is a prerequisite for life and enters when the inspired air from the lungs goes to the left ventricle of the heart where it is changed to vital pneuma. This is then distributed through the arterial system to enter all parts of the body including the brain through two vascular structures. These two structures are: rete mirabile = network of fine arteries lying at the base of the brain and choroid plexuses. Galen felt that the vital spirits were converted in the rete mirabile into animal spirits that were stored in the cerebral ventricles and then went into the hollow nerves to produce movement and sensation. He developed a concept of localization of mental activity. His concept was that imagination, reason and memory were the three intellectual functions that could be affected separately. In the field of neuroanatomy Galen described cranial nerves, such as corpus callosum, the tectum, the formix, the epiphysis of pineal body, the sympathetic chain and posterior roots of the spinal nerves. He also defined the recurrent laryngeal nerve characterizing it as vocal nerve. Not only he described the ventricular system of the brain as the seat of the psychic spirit, but also he studied extensively the function of spinal cord, focusing its importance on the movement of the body. Brain plays a major role in the homeostatic equilibrium of the soul.The psychic spirit ( pneuma) according to Galen resides in the ventricles of the brain. It is the psychic pneuma which accounts for sensation and voluntary motion. Responsible for the cognition, the perception and the memory is the brain. The mental and psychical health of the human being is based on the equilibrium and the harmonious relationship between the three parts of the soul, which are the brain, the heart and the liver. Galen characterized motor nerves coming from the posterior part of the brain as hard and sensory nerves from the the anterior part as soft. He thought that the anterior part of the brain is the seat of perception and reason, though the posterior plays a a major role in the life and vegetative function of the man. According to him, the brain is the hegemonikon, the principal organ which rules and controls all the functions and activities of the human body. 9. Rose C. F.(2009). 'Cerebral Localization in Antiquity'.Journal of the History of the Neurosciences, 18 ,pp.239-247.